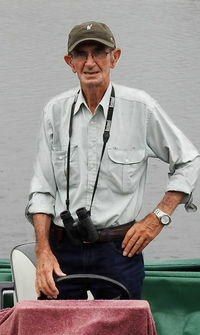 I am an experienced and enthusiastic birdwatcher and amateur photographer with early morning bird tours and sunset cruises on the Daintree River and Barratts Creek, Stewart Creek and sometimes Joe Bairds Corner. Having worked on the Daintree River for many years, in all seasons and weather, I have come to love and respect the river. No matter how many times I go out on the river there is always something new to see and would do so for the next hundred years….. if that was possible. It is that type of river, with all of its different eco systems, the rainforest and mangrove system, where you can see the amazing and beautiful bird life, snakes, frogs, lizards, turtles, butterflies, mammals, insects, epiphytes (plants that grow on trees) including the lovely orchids, and of course the renowned saltwater crocodile. I would like to mention my time with Dan Irby of Mangrove Adventures. I am grateful for his training, his valuable knowledge of the Daintree River and his patience to my enthusiastic nature. Without his influence, I would not be the guide that I am today.